let’s say you want to use OpenGL inside your GTK+ application. let’s say you don’t know where to start, except for the API reference of the GtkGLArea widget, and all you can find are examples and tutorials on how to use OpenGL with GLUT, or SDL, or worse some random toolkit that nobody heard about. this clearly won’t do, so I decided to write down how to use OpenGL with GTK+ using the newly added API available with GTK+ 3.16.
disclaimer: I am not going to write an OpenGL tutorial; there are other resources for it, especially for modern API, like Anton’s OpenGL 4 tutorials. I’ll spend just a minimal amount of time explaining the details of some of the API when it intersects with GTK+’s own. this blog will also form the template for the documentation in the API reference. the OpenGL support inside GTK+ requires core GL profiles, and thus it won’t work with the fixed pipeline API that was common until OpenGL 3.2 and later versions. this means that you won’t be able to use API like glRotatef(), or glBegin()/glEnd() pairs, or any of that stuff. the dependency on non-legacy profiles has various advantages, mostly in performance and requirements from a toolkit perspective; it adds minimum requirements on your application — even if modern OpenGL is supported by Mesa, MacOS, and Windows. before you ask: no, we won’t add legacy profiles support to GTK. it’s basically impossible to support both core and legacy profiles at the same time: you have to choose either one, which also means duplicating all the code paths. yes, some old hardware does not support OpenGL 3 and later, but there are software fallbacks in place. to be fair, everyone using GL will tell you to stop using legacy profiles, and get on with the times. 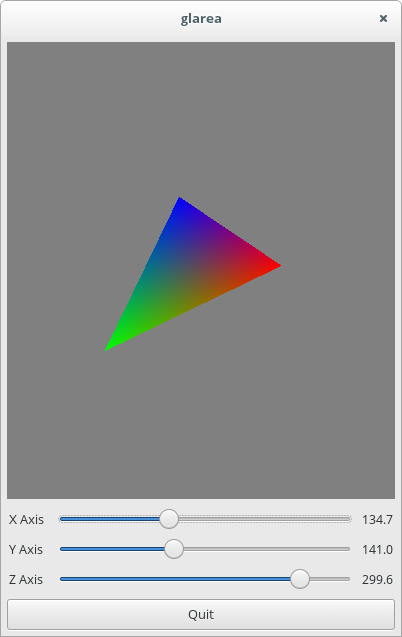 let’s start with an example application that embeds a GtkGLArea widget and uses it to render a simple triangle. I’ll be using the example code that comes with the GTK+ API reference as a template, so you can also look at that section of the documentation. the code is also available in my GitHub repository. which contains the definition for adding a GtkGLArea and connecting to its signals. if there were any errors while initializing the GL context, you would see them inside the GtkGLArea widget itself; you can control this behaviour, just like you can control the creation of the GdkGLContext yourself. as you saw in the code above, we use the GtkWidget signals to set up, draw, and tear down the OpenGL state. 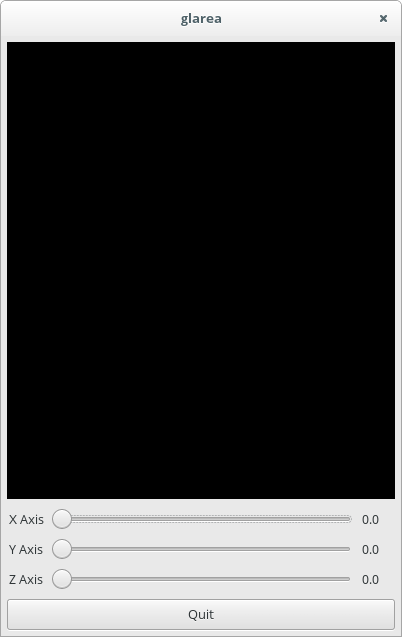 in the old days of the fixed pipeline API, we could have simply connected to the GtkGLArea::render signal, called some OpenGL API, and have something appear on the screen. those days are long gone. OpenGL requires more code to get going with the programmable pipeline. while this means that you have access to a much leaner (and powerful) API, some of the convenience went out of the window. obviously, it’s a bit more complicated that. the fragment shader is executed once for each fragment, or pixel-sized space between vertices. then we queue a redraw on the GtkGLArea widget, and that’s it; the draw_triangle() code will take the matrix, place it inside the vertex shader, and we’ll use it to transform the location of each vertex. there is obviously a lot more that you can do, but this should cover the basics. the GDK drawing model was simpler, in those days, so these libraries just took a native windowing system surface, bound it to a GL context, and expected everything to work. it goes without saying that it is not the case any more when it comes to GTK+ 3, and with modern graphics architectures. both libraries also had the unfortunate idea of abusing the GDK and GTK namespaces, which means that, if ported to integrate with GTK+ 3, they would collide with GTK’s own symbols. this means that these two libraries are forever tied to GTK+ 2.x, and as they are unmaintained already, you should not be using them to write new code. GtkGLExt is the library GTK+ 2.x applications used to integrate OpenGL rendering inside GTK+ widgets. it is currently unmaintained, and there is no GTK+ 3.x port. not only GtkGLExt is targeting outdated API inside GTK+, it’s also fairly tied to the old OpenGL 2.1 API and rendering model. this means that if you are using it, you’re also using one legacy API on top of another legacy API. if you were using GtkGLExt you will likely remove most of the code dealing with initialization and the creation of the GL context. you won’t be able to use any random widget with a GdkGLContext, but you’ll be limited to using GtkGLArea. while there isn’t anything specific about the GtkGLArea widget, GtkGLArea will handle context creation for you, as well as creating the offscreen framebuffer and the various ancillary buffers that you can use to render on. 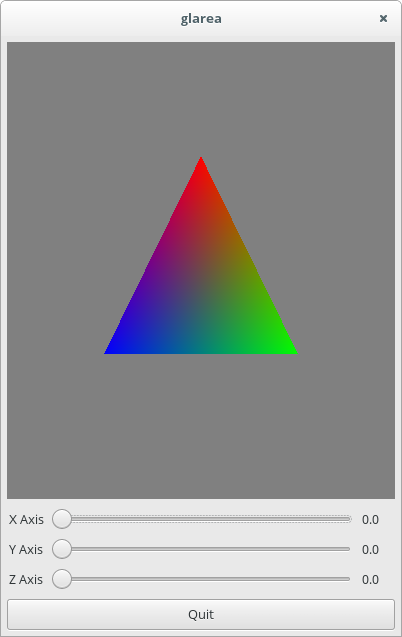 GtkGLArea is another GTK+ 2.x library that was used to integrate OpenGL rendering with GTK+. it has seen a GTK+ 3.x port, as well as a namespace change that avoids the collision with the GTK namespace, but the internal implementation is also pretty much tied to OpenGL 2.1 API and rendering model. unlike GtkGLExt, GtkGLArea only provides you with the API to create a GL context, a widget to render into. it is not tied to the GDK drawing model, so you’re essentially bypassing GDK’s internals, which means that changes inside GTK+ may break your existing code.